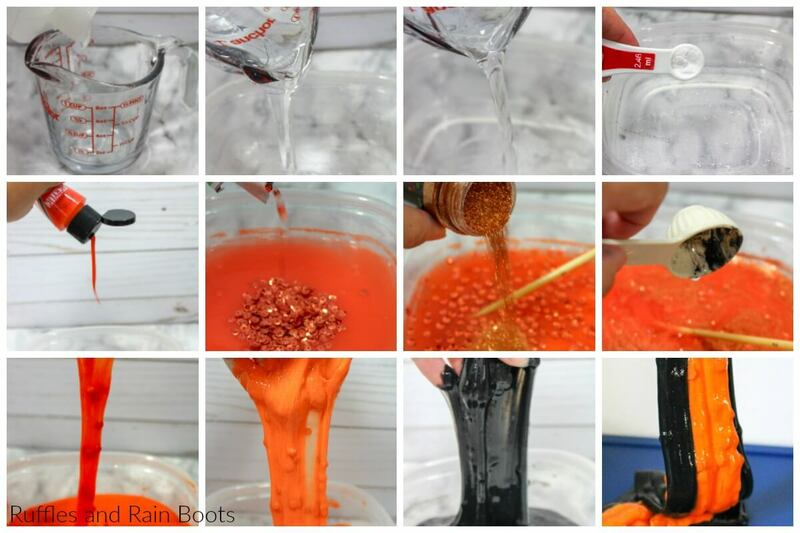 Make this two-color Halloween slime in just minutes using ingredients safe for even the smallest hands. Let’s get started with a little spooky science! If your kids are anything like mine, you hear, “How many days until Halloween?” 300 times a day in October. I even created this cute Halloween countdown printable because I was being asked in August! We like to come up with easy, quick crafts to help generate excitement about holidays. Halloween is filled with so many opportunities, both learning-centered and just plain fun. Click here to see all of our Halloween crafts and food ideas. 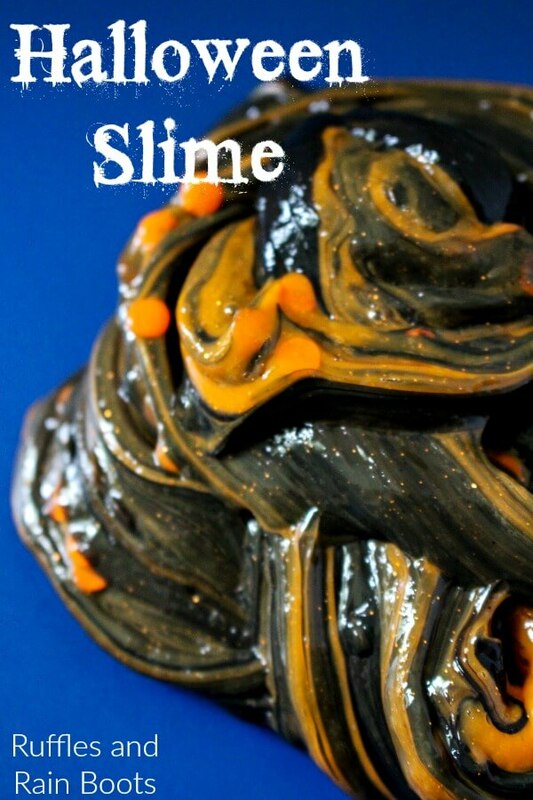 We are no stranger to awesome slime recipes here on Ruffles and Rain Boots. 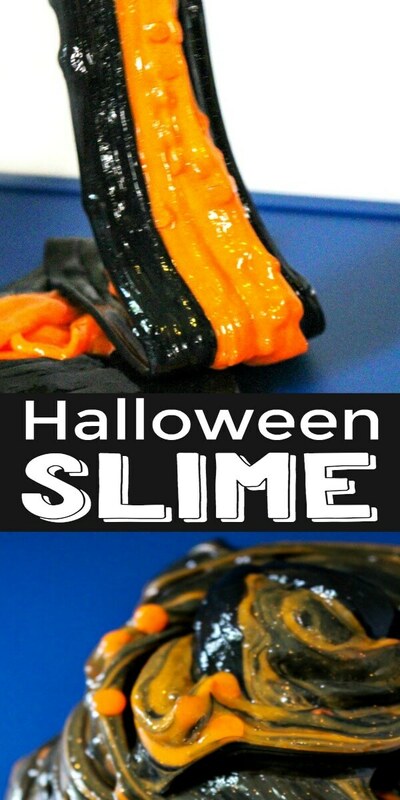 This Halloween slime recipe is a play idea which would allow you to focus on science, fun, or both! You’ll need a small craft bowl and spoon to mix each of the slimes and an airtight container to store them. NOTE: this makes a lot of slime. If you need a small amount (great for little hands), make one batch or half the recipe using the measurements in parentheses. Check out our Amazon shop for our favorite slime and floam making supplies. These two colors start out separate and after a great deal of mixing form a new color! Depending on the amount of paint used, the final color will be different with every mix. Add an entire 5-ounce bottle of glue to the bowl and stir in the water. Stir in the baking soda. Stir in a single color of paint to your desired color and then add in the glitter and sequins to your liking. Mix in 1 tablespoon of contact solution, noting that it will be very sticky at this stage. Once it’s mixed in, remove the slime from the bowl and knead it until it’s no longer sticky. 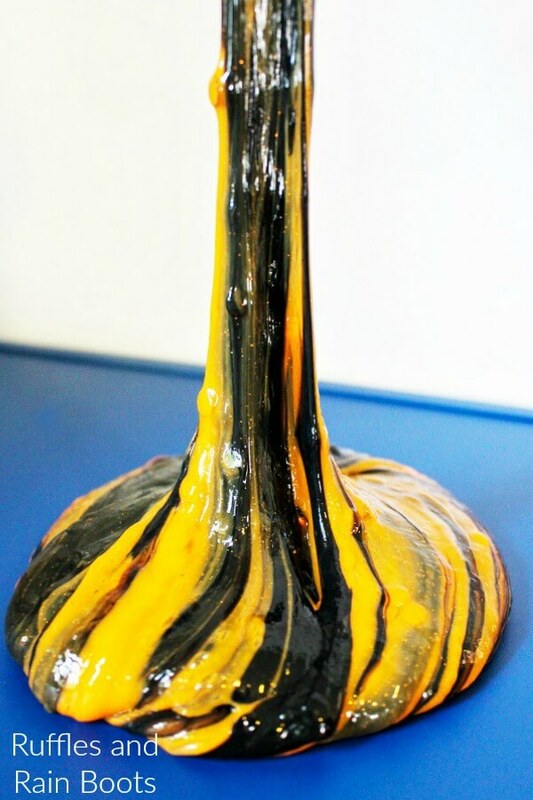 Repeat the process for the other color slime. RELATED READING: Monster Floam to Make for a Sensory Experience! Your shares are how we grow and we are very thankful when you share. 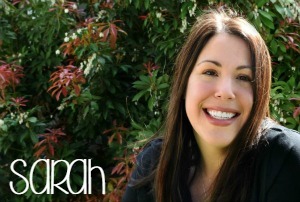 We love to share our slime for adults AND slime for kids recipes with everyone!